After the fourth of July break we got back into Kids Camp but with a twist – with middle schoolers! Our theme for the week was New Orleans festivals which was great for the campers to learn more about their favorite festival foods and the reasons they’re so popular at these festivals, but also great for the Duke counselors as they learn more about New Orleans and the city’s interesting traditions. We started off the week with JazzFest and modeled our menu for the day off foods served at this year’s celebration. Just like any other week, though, before we got into cooking we had the campers make team posters. We got to meet the JazzFest Jam-balayas, the Mardi Gras Powerful Paraders, the Food-specific Festival Festive Foodies, the Second Line Second Liners, and last, but not least, the Reveillon Midnight Eaters. Afterwards, we learned about kitchen safety and moved into our cooking stations where we prepared a number of different items: Strawberry Hibiscus Tea, Crawfish Bread, Spinach-Artichoke Casserole, and Mango Freeze. 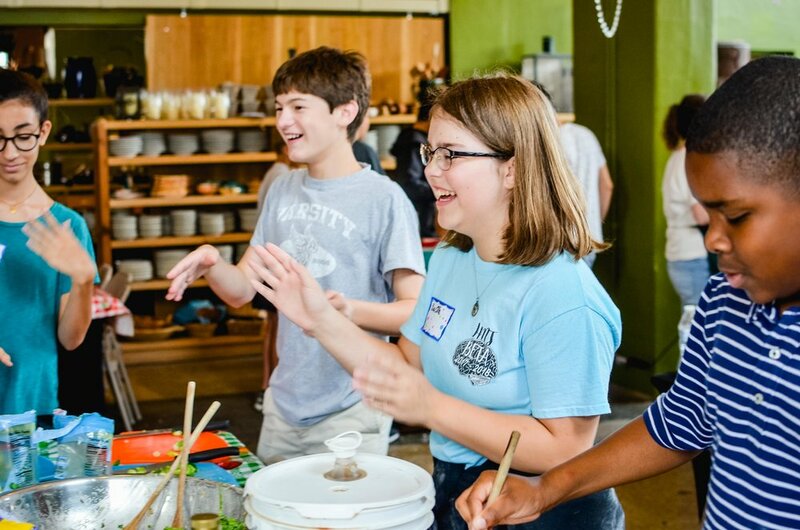 Most campers were well familiar with these New-Orleans-famous dishes and were excited to learn how to make them while some of us had never tried them before and were glad to find new favorite foods! After cooking, the campers played a quick game of Refrigerator Tag outside. In Refrigerator Tag, one person is “It” and calls out a food to which the others respond by running to one of four bases: “Not My Favorite,” “Love It,” “It’s OK,” and “Never Tried It” while the one who was “It” tried to tag one of the others running. After a couple rounds, during which our crawfish bread baked, and our mango freeze froze, we all met back inside to try everything and talk about the highs of the day before leaving for the afternoon. Today’s theme was Mardi Gras! The theme gave us an opportunity to fry up some chicken, make maque choux, and bake moon pies. We started off the day with an interesting presentation from various professionals in the food industry. We learned it’s not all about line cooks, but restaurant managers, pastry chefs, cookbook writers, and trip planners all have an important role to play. We started cooking stations after we thanked the presenters for their time and a lot of campers were able to try frying for the first time. Our game for the day was all about getting to know each other and we did that with “NOLA Bingo.” Each camper had to inquire other campers for their signatures on a space when they fit the description for it such as: “Has walked in a second line.” While NOLA Bingo was going on, we had the Powerful Paraders finish up frying our chicken and we’re glad they did because they were a big hit along with the moon pies! Wednesday was the most creative and challenging day as the campers enjoyed three rounds of Chopped! They worked in teams of six to plan and execute an appetizer, an entrée, and a dessert. Each round of Chopped! was based off of a New Orleans food festival to keep on theme for the week. During the appetizer round, we celebrated the Creole Tomato Festival, and the campers had to use tomatoes, black beans, limes, and tuna to create a delicious, perfectly plated appetizer for the judges. Next was the entrée round, which celebrated two festivals: the Louisiana Seafood Festival and Tet Fest, an ode to the Vietnamese population of New Orleans. The ingredients for this round were shrimp, rice noodles, pickled vegetables, and bean sprouts. Many teams decided to stir fry and added lots of different sauces to their dishes. In between rounds of chopped, the Festive Foodies helped transition by cleaning cooking utensils and wiping tables. The final round was dessert with theme chosen to be the Ponchatoula Strawberry Festival. In the baskets, the campers found strawberries, ricotta cheese, Cheerios, and rosemary. Some chose to make a shortcake, while others opted for a strawberry-ricotta cheese parfait. Each round was judged on taste, presentation, and teamwork. The competition was fierce, but each team took home at least one prize throughout the three rounds. Between rounds, the campers enjoyed a few rounds of Mingle, Mingle where they got to know each other and discussed the Chopped! ingredients they had to use. 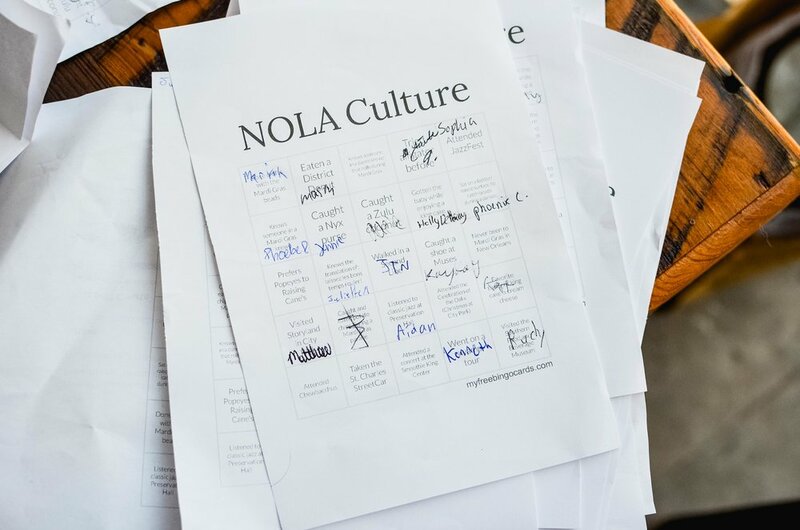 On Thursday, the campers celebrated the New Orleans tradition of the Second Line through foodways associated with the parades. In the morning, the campers worked to prepare the sauce for Friday’s meal, as it had to braise for four hours in order for the beef to be tender enough to serve. 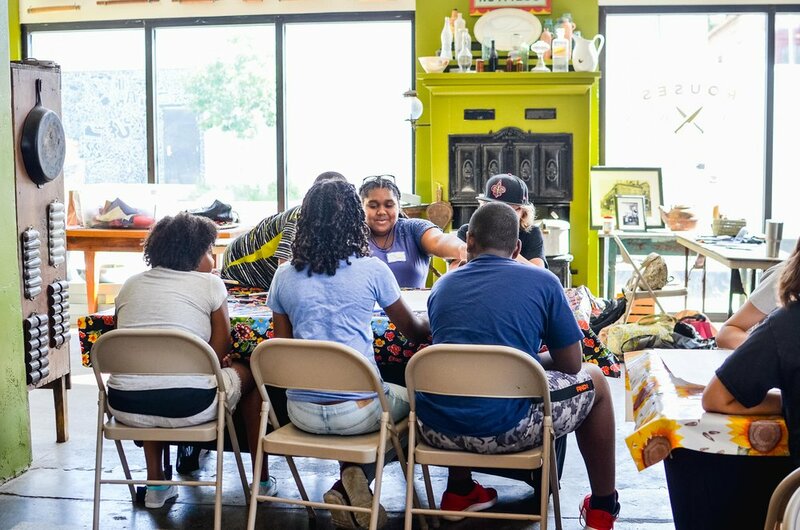 After cooking Friday’s ragu, the campers played a round of Jeopardy featuring the categories of NOLA cuisine origins, NOLA restaurants, NOLA food festivals, and food technology. While it was a very close game, the Powerful Paraders emerged victorious. After Jeopardy, the campers moved into the day’s cooking stations where they prepared peas, mashed potato salad, oven-fried catfish, and macaroni and cheese starting with a golden roux. These foods were selected to model a traditional Second Line plate. 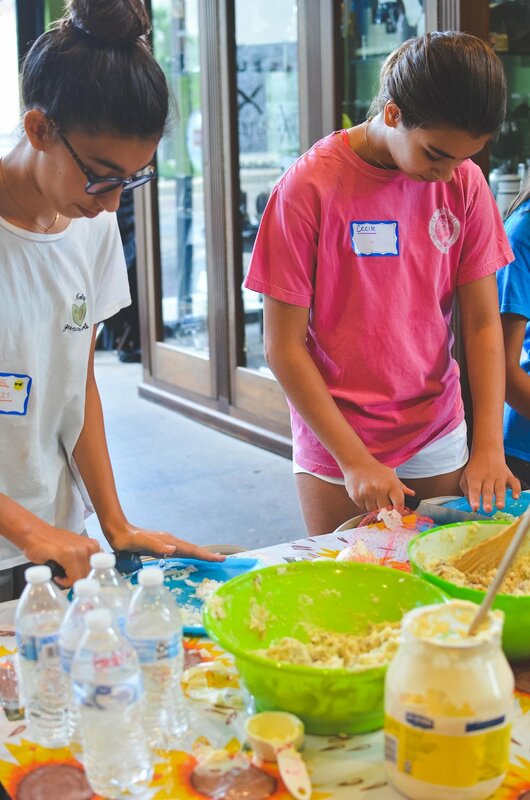 Many of the dishes were complex, and the campers were able to make familiar foods from scratch for the first time. The Second Liners team stayed inside to plate the food while the rest of the campers played a game of Epidemic. Luckily, the hard work paid off, and the food was delicious! The theme for Friday was Revéillon, which is a midnight feast traditionally celebrated in French-Catholic regions on Christmas Eve. After a long day of fasting and the Christmas mass, families would travel home for a decadent feast which lasted long into the night. Before cooking, the campers received cookbooks containing all the recipes from the week. They mades notes about the recipes they liked, as well as things they would change when cooking the dishes at home. Then, they painted custom covers on the front. 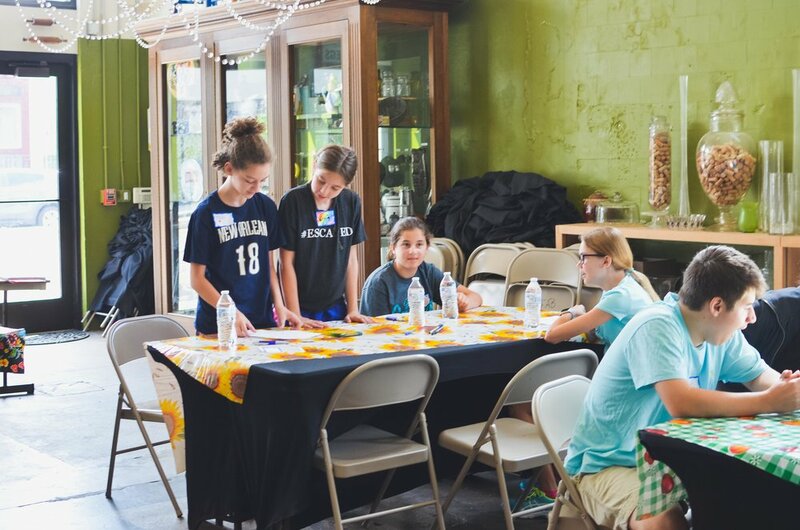 After cookbooks, the campers were tasked with creating their very own Revéillon menus. 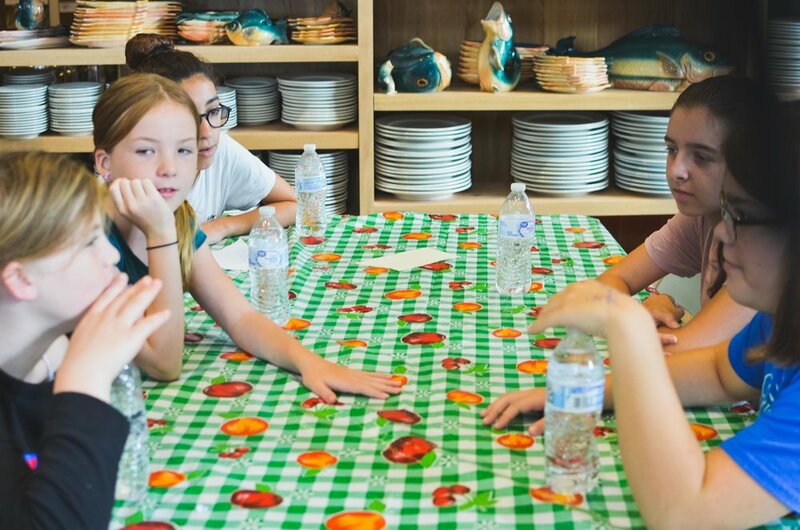 They worked with partners to name their restaurant and plan an appetizer, entrée with side, and dessert, choosing traditional Revéillon ingredients like duck, cabbage, and dried fruits. 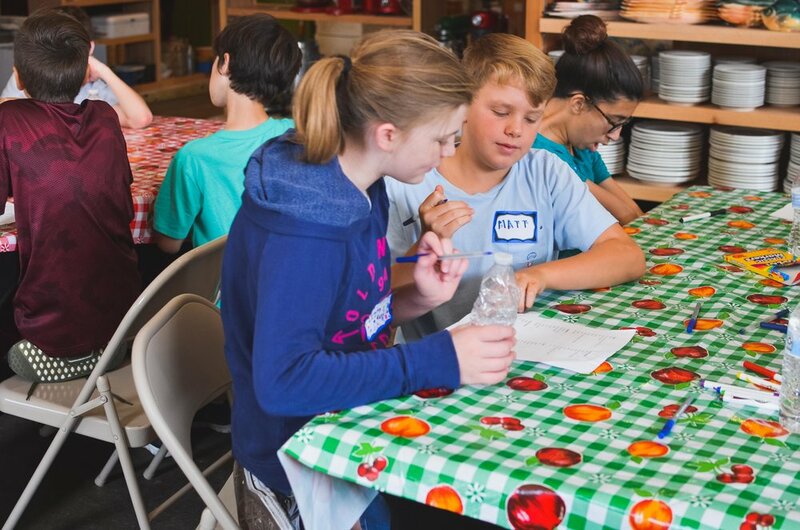 Next, the campers moved into cooking stations where they made homemade gnocchi to pair with the beef ragu, a kale and brussels sprout salad with maple tahini dressing, and a pear and apple galette for dessert. The Midnight Eaters stayed inside to help plate the feast while the rest of camp headed outside for another round of Epidemic, a camp favorite. SoFAB Revéillon was a smashing success, the food was divine, and we completed another fun-filled week at camp!